Just to let people know that there will be a German edition of the Deep Purple book Wait For The Ricochet later this year. Published by Hannibal, it will look very similar to the original, with the same illustrations and format. If anyone is interested, the title can be pre-ordered already from the publisher’s own site. Hard to believe but the album is 48 years old this very month, and was of course a massive seller in Germany where it topped their album charts for weeks. If you do not have this book yet, the English edition is back in stock through the publisher’s own shop. And their follow-up devoted to Machine Head and titled Fire In The Sky is now not far away. The publishers would like to thank Lutz and Andreas for their help in making this German edition possible. Has anyone got a good clean scan of the album review from America’s Creem magazine in 1972? It most likely appeared in the May or June issue but might have slipped to Oct or Nov (they have checked other issues). In a similar search they are trying to source a good clean scan of the single review from the Australian music magazine Go-Set, printed in the Oct 6th 1973 issue. A contact there has kindly sent all the issues from microfilm but this page is too faded to use. Spotted the new issue of Planet Rock magazine lurking behind a newsagent’s counter in Chesterfield at the weekend with a familiar cover image; the In Rock sleeve (foldout and embossed no less!) They only had one copy and it was reserved, but a nose about suggests a 15 page “epic” interview with the Messers Gillan, Glover and Paice amongst other things. The magazine is newish (I think this is issue 6), so not as well distributed as more established titles, but looks like it’s worth hunting down. And it hasn’t taken them anything near as long as Classic Rock did to get them on the cover either! Glenn has also blagged himself another cover story, the American magazine Bass Player dated jan 2018 but on shelves now. “The toughest man in rock” apparently! BCC also made the front of Interactive Guitar Number 53, but this is an online only magazine. Can you collect those? Will anyone want to look at real things in the future? Thanks to Stephen Clare for the info. The publishers are now taking pre-orders for Steve Wright’s exhaustive Graham Bonnet biography The Story Behind The Shades, with a September delivery date confirmed. Anyone who orders ahead of then from here gets a bit of a discount too. There is a regular softback, 176 pages (plus 160 rare photos and 170 items of memorabilia! ), and also a signed copy in a deluxe slipcase with a laminate which is exclusive to the publisher’s online store. Details of the editions on their site. The Rainbow saga is included, and there is a nice forward from Purple’s Don Airey too. Graham’s band have a new drummer (who actually joined for the UK tour late last year) and a new guitarist, but did bring in three members of his original 1967 group for the one-off encore at Skegness last month. There is a new studio album in progress, a live set from 2016 in Italy out on CD and DVD, and he will be guesting with Michael Schenker in the UK later this year. Incredibly Graham got to see Deep Purple for the first time ever the other night and met up with his old mates Roger and Don afterwards (first time in 37 years! ), posting a selfie we’ll show below. The book basically covers the entire build up from the first days of Mk 2 through the recording sessions for the first Mk 2 studio album and then the In Rock tour, an intense two year period, researched in remarkable detail, chock full of photos and memorabilia. From Jon Lord’s mum defending her lad in the Melody Maker, to Roger Glover’s hints for dying crushed velvet trousers green. From the location of the gig where Gillan was auditioned, to Ritchie shopping for strobe lights. From the In Rock engineer’s matter of fact description of Ritchie recording the guitar solo for Child In Time, to Ian Gillan explaining the need for tight trousers to sing the vocals, it’s all here. What’s more there is a discount on the retail price which is extended for the next two weeks if you order through the publisher’s shop. The links below will give you more information and page visuals. And if you already have the book, celebrate like I am by playing a cut or two off the album later today (to get Liar Liar out of your brain if nothing else!). A wedge of Glenn Hughes back-catalogue is appearing through the new Purple label run via Cherry Red. Some offer no extras over and above what has been out before, but Feel gains a bonus disc of live material from Holland, Germany and Japan recorded in 1994. Source is not known, the shows have all appeared as bootlegs but they may have gone looking for original tapes. Addiction, one of my faves from the man, has a live show from Holland in 1995 as a bonus disc. Again this has appeared as a decent bootleg before (one of the boot sleeves is shown above.) Thanks to Mark Maddock. Also busy on the archive front is Graham Bonnet, with a new Anthology CD/DVD combo any time and there is a more recent CD/DVD set taken from a festival slot in Italy in 2016 also on the way. His biography is in the very final stages of production and is expected to be in print during June. Check the publisher’s site for more info or to register for early details. Thanks to Stephen Hines for the info (and owner of one of the best email names I’ve seen so far!). I wasn’t overly impressed by the recent version of the Rainbow Donington material – the audio was still incomplete and the video we’d been sold before. Even so I was surprised to learn that they’d hacked out TEN MINUTES of surviving material to get it onto a single CD for the European edition, but left it intact for the Japanese edition which is a 2CD set. It’s quite depressing that labels are still taking the piss like this. Anyhow, Tim Summers bided his time and splashed out on a Japanese import, so can clue us in on what we might expect when Universal decide to do an even more super remastered edition for us to cough up for next year…. The Difficult To Cure to Lost In Hollywood section lasts a good four minutes longer thanks mainly to Don Airey’s solo; Ritchie’s blues is over half a minute longer, Lazy gains a few seconds, but most crucially they’ve included the Kill the King instrumental and LLRnR reprise which is another five minutes plus. And for those who like to recall the opening of the show, the Pomp & Circumstance intro is there as well. Packaging wise the Japanese edition just repeats the lack-lustre European art and booklet, adding only the obligatory Japanese translation to this.I’m not sure if we mentioned this before but when I met Steve Wright, the writer of the Bonnet biography, a while back he says Graham recalls going to a screening of the full Donington show with others from the band and having a two disc vinyl acetate of the full show, a copy of which was given to all the band (Graham has lost his!). The woman who used to manage him was quite close to sourcing the full footage a few years ago, but when she moved on the thread lapsed. There is a well founded story which says the bass was not properly hooked up for the recording of the show and Roger had to add this later in the studio. Always a good start-back office chore is a careful sweep through the in-tray, which had crept up to 450+ emails over the winter break. And it does help bring things into focus. Of course the music scene has rightly been mourning the death of Lemmy, one of rock’s great characters apparently according to the TV. I suppose that’s because most of the mainstream press didn’t really understand his music or playing ability. I still get shivers down my spine recalling that first eponymous Motorhead 12″ single on Chiswick Records which I bought close to release date back in 1977. Lemmy auditioning on nose jug for the Gillan band. Somehow I never did get the see them live in those early days (and they did tour with Purple as recently as 2007), but had been a big Hawkwind fan and met Lemmy at one of those weird all night rock events at the Queens Hall in Leeds. I’ve no idea how but we ended up being allowed into the hospitality room for the concert performers and Lemmy conned a nice button badge off my brother’s jacket. All he can recall was being sat by the side of the stage watching the show when a naked American woman came over and sat beside him. “Oh well, I’d best get on and wobble these around a little,” she explained after a while before we realised it was Stacia. Funnily enough I was doing some vinyl sorting last week and checked my mint copy of their second album, signed by all the band… except Lemmy himself. Mind you he was busy telling us how much grass he’d smoked during the day so perhaps it didn’t seem quite the moment to get all fanboyish! Lemmy was always respectful of what he called Deep Purple’s place as the originators of hard rock (and one of the first to use pyrotechnics, at the California Jam). Closer to home, we also lost our mate Martin Lilleker who has been suffering from Alzheimer’s for several years. Martin was one of those irreplacable and unique cogs in the local community music scene; he wrote music columns for the local press for decades, ran a label for a time, helped manage and played live a bit too. In recent years he also documented the scene magnificently across two thick paperbacks on the history of Sheffield bands going back to the early 60s. I helped him with a few bits for these and when I bemoaned the poor design of the first book’s cover he let me have a free hand on book two and was brave enough to go ahead with an admittedly quite eye popping montage! It’s guys like Martin which make living in Sheffield just that little bit more enjoyable and we’ll miss him. Looking forward it’s amazing how much enjoyment people get looking back, if the flurry of excitement about a new audience tape of Deep Purple from back in Feb 1972 at the Dagenham Roundhouse is to go by. The owner had got in touch with us in the lead-up to Christmas but seemed unable to wait to see if this could be done officially and pushed it out into the pirate networks instead. Amazing that new recordings can still emerge after forty plus years. It seems churlish to point out (as one expert did) that the cover photo is from the night before…! Deep Purple, Spontaneous Combustion, Licensed Bar AND A CAR-PARK! We used to know how to have fun in the Seventies. Talking of history, a few people have pointed me to a copy of Wait For The Ricochet currently selling on ebay. Or rather not selling, as the owner wants £1,001.86 for it. Since I went to have a peep (just to see if it was for real) ebay now keep asking me if I’d like “to take another look?”! I wouldn’t mind but the cheeky sod wants £2.75 postage as well… I added it as a watched item just to get his hopes up. Hopefully this year we’ll get it back into print, but the priority right now is in finishing the follow-up, Fire In The Sky. And tracking down the current owner of the E-Type Jag Jon drove down to Montreux in. It’s all in the detail! With the fun and games over the Rock & Roll Hall Of Fame still ongoing, it’s good to see friends and fans of the late Cozy Powell have been able to organise things with far less aggro, and are putting up a blue plaque in the town of his birth, Cirencester. It’s very short notice, but if you’re free on January 7th then there is a public unveiling at the Corn Hall at 2.30pm with Brian May doing the honours. People like Bernie Marsden, Don Airey and Neil Murray will be there. It looks as if the long-mooted documentary on Cozy is also now in the works. The man himself would have been 70 next year. As for ‘works’ we’re fairly confident the major labels are now about sorted when it comes to the Deep Purple classic era catalogue. The bizarre Universal LP box set (below) looks a real dog’s dinner, but I’m told better things are on the way with the return to catalogue of most of the regular albums (incredibly many have been off the shelves for some years now). There are also plans afoot with regards to other areas of the catalogue about which more as the year unfolds. I have had meetings with some of the people involved and it looks quite promising. Switch off your G5, reissue of the year award 2016 is surely a given! 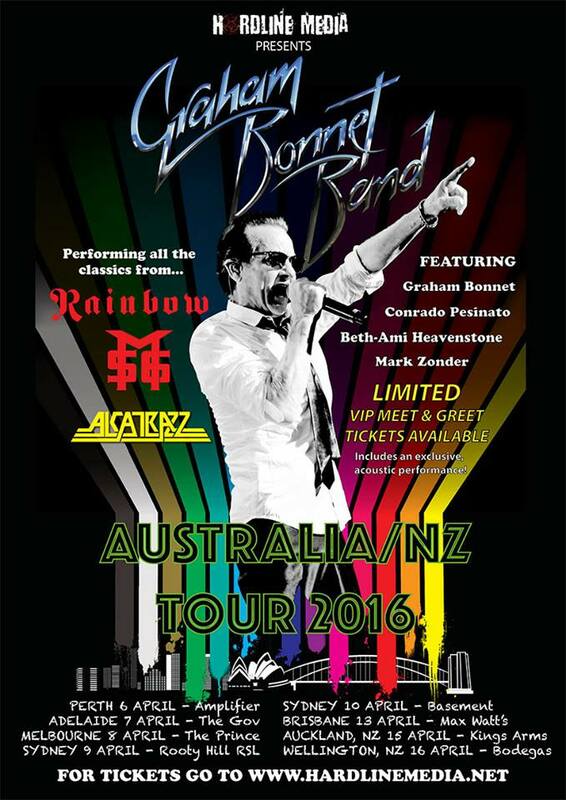 Some of you have also got the Rainbow gigs to look forward to. I guess we can’t really call it a reunion when only one member is coming back, but for everyone who missed out it looks as if more shows will follow in 2017. A souped up version of the first album is also due, though as the mutli-tracks are still lost there isn’t too much scope for content. The first pics of the new Rainbow came through recently, reminding me of that excitement back in 75 when shots of the first group emerged and were being posted about by people to reproduce in fanzines etc. I shall not be hurrying to repeat the experience this time round! As for Purple themselves it’s still good to listen to play bits and pieces off Now What so hopefully the band can again produce something of interest when they start recording in the next few weeks (will the first one into the studio hide Don’s ELP collection?). I’ve got my plate full with design work to wrap up on three books this month, so I’d best fire up InDesign and get cracking. But before I do, here’s a few anniversaries coming up in 2016 to make everyone feel that little bit older! 35th anniversary of Whitesnake’s Don’t Break My Heart Again hit single. 40th anniversary of Deep Purple Mk 4’s final concerts. 50th anniversary of Art Gallery by The Artwoods. Simon Robinson. My thanks to factoid checkers and news editors Mike Richards, Martin Ashberry, Tim Summers, Vince Chong, Mark Maddock, Matthew Kean and Ian Gillan’s surprise dinner guest – Britney Spears. 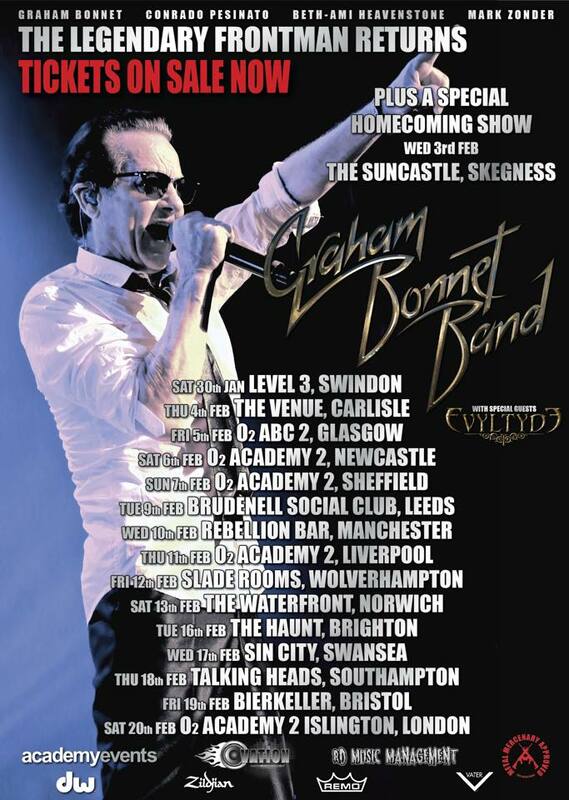 Graham Bonnet is touring the UK in February 2016. To save my fingers, I’ll attach the official flyer. It’s wrap-up warm time, especially if you opt for the Skegness homecoming show. I’ve been there in the winter and it’s biting! I missed his last UK tour as I was stuck in frozen Cheshire on the afternoon of the Sheffield gig. Graham is also doing eight shows in Australia in April which might be warmer, I might as well add that flyer as well. This is with his new band, and a studio album is in the works for Frontier Records, which will have a bonus disc of reworked oldies apparently. His biography is nearly wrapped up and will be out early 2016. There may now be a limited edition in a hardback cover designed by Graham himself. You can read more about this and see some spreads at the publisher’s site. Just a quick update on the Deep Purple photo book; the publishers say pre-orders will be open soon, so to make sure you get the news first, subscribe to the dedicated newsletter service as people who do will get the info direct, along with another bunch of visuals (with some great photos from the band’s 1973 Rainbow Theatre concert). Or you can subscribe and read our story on the project if you click here.